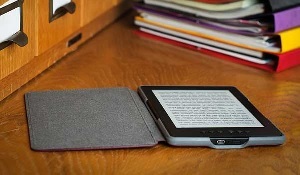 In 2011, recognizing the increasing importance of ebooks to superior research outcomes, ProQuest set out to strengthen the ebook marketplace by assembling a rich mix of talent, technology and content. We invited ebrary to join our company, bringing its extensive catalog, inventive research tools and its team of creative, entrepreneurial minds. EBL joined next, enriching us with its selection of ebooks, imaginative options and access models for librarians and patrons, and another injection of creativity to keep libraries ahead of patron expectations. 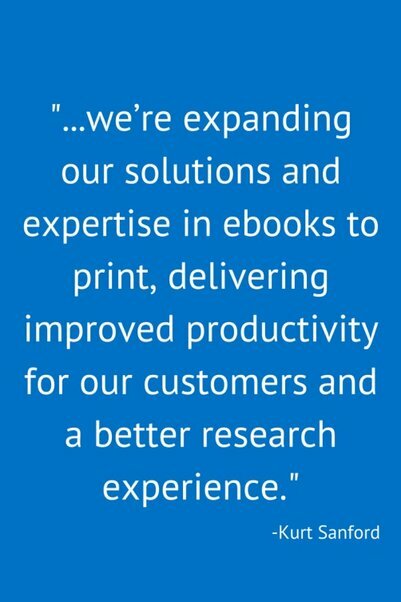 Today, we’re announcing the next step: we’re expanding our solutions and expertise in ebooks to print, delivering improved productivity for our customers and a better research experience. We’ll assume ownership and management of Coutts and MyiLibrary, with its extraordinary catalog of print and e content, and form a strategic partnership with Ingram for print fulfillment. This means all ProQuest and Coutts customers will get access to the widest selection of books – both print and digital – along with the best ebook tools on the market. For print, they’ll tap into Ingram’s fast on-demand print capabilities and vast delivery network. Most importantly, this will enable ProQuest to deliver fully integrated workflows and improved user experiences for both ebooks and print. Every element of this latest acquisition and partnership means better service and better options for libraries in serving their patrons. • The widest selection of ebooks. ProQuest already has more ebook titles than anyone else, and MyiLibrary adds even more. The combined catalog provides an unparalleled selection of quality titles. • Leveraging the strengths of market leaders. Looking ahead, we’ll be bringing the innovation that makes ProQuest the leader in ebooks to MyiLibrary and OASIS customers. ProQuest customers will benefit from Coutts’ collection-building expertise, approval support, and gain additional tools for streamlined ordering. • Integrated workflows for e and p: We will begin developing a fully integrated service with simple, efficient workflows that span print and digital. Librarians will have flexibility to build dynamic collections that meet the unique needs of their community of researchers with support from DDA, approval plans, subscriptions, as well electronic ordering and invoicing. What doesn’t change? Our respect for choice in the marketplace. We’re committed to keeping the Coutts and ProQuest networks as open as they have always been. And, we are seeking to maintain existing ProQuest and Coutts partnerships such as YBP, OCLC, ExLibris, Google Scholar, and others. This is a journey we’re taking with librarians and the researchers we all serve. We’re eager to listen to what you think, what you want, and what questions you have. We are, as always, eager to hear your feedback. Please contact us directly with any questions, talk with your ProQuest or Coutts account representatives, or reach out to any member of our team.